“I have more faith in the sport and I have more faith in myself. I respect myself more. I am not lying to myself." - British sprinter Dwain Chambers who has returned to the sport after admitting to cheating. Now that Ivory Williams has tested positive for marijuana at the US championships, Chambers will be the #1 seed for a world championship medal in Doha. We wanted to pick true freshman Robby Andrews over Olympian Andrew Wheating in the 800 but we came to our senses. See who we're picking in the distance races and in the team race on the men's side. Before Vin Lananna came to Eugene, the best Oregon's women had ever finished indoors was double digits. This year they might win it all but the man behind the curtain will be watching from home. Elites Announced For This Weekend's Gate River Run in Jacksonville - US 15km Championships Tim Nelson almost won last year and he's back for a race with Team USA Minnesotans Patrick Smyth and Antonio Vega. Jen Rhines is the big name on the women's side and might get her stiffest challenge from Colleen de Reuck. Usain Bolt Wins Laureus World Sportsman Of The Year For 2nd Consecutive Year Bolt is the Tiger Woods of track and field. That comparison used to work so well. Marion Jones Officially Is A WNBA Player Kids, let this be a lesson to you. If you do drugs, you too might end up in the WNBA. Spain Reforming Drug Laws To Prevent Cheats From Running Rampant From those countries that actually test and punish their cheats: we say "thank you". LetsRun.com The Week That Was This week we dish out Weekly training advice from coach Jama Aden and our Stat of the Week from Down Under, praise Doug Logan, and give a Thumbs Down to athletes skipping Worlds, especially Qatari Saif Saaeed Shaheen. Plus we set the over/under on US mid-d/distance medals in Doha and have updates on Alan Webb and Serena Burla. *Kyle Merber's 3:58 Makes Him 17th Heptagonals Runner Sub-4 Every school in the heptagonals (including former members Army and Navy) have had a sub-4 miler on their team at some point. *Former Harvard Triple Jump Heps Champ Is Competing For Haiti In Doha The true amateur spirit: Samyr Laine, a law student at Georgetown, says he's not in the sport for the money but to pursue excellence. 17-Year-Old Marathoner Inspired By Billy Mills Oliver Bear Don't Walk is 17 and ran 2:37 in his first try at the marathon. He says: "My goal is to keep running long enough to get to the Olympic Trials in the marathon and hopefully the Olympics." We wish him luck. Marathoner Going For Sub-3 Clocking In 5th Decade 53-year-old Gary Allen ran a sub-3 in the '70s, '80s, '90s, '00s and is going for the '10s. USATF CEO Doug Logan On The Deficiencies He Has Noted In Track Events - Live And On TV We are glad to see Logan is working on improving the way track is presented as a live event and on television. Webb A Hit At Olympia Running Store The bigger news to distance fans is how Webb is recovering from Achilles surgery. Brief Chat With Paige Higgins - Running LA On March 21 Higgins is training with Training Talk III guests Greg McMillan and Brett Gotcher in Flagstaff. Bett and Felix Take Almond Blossom XC Titles This was the last IAAF XC permit meet. "A victory has plentiful fathers, and a defeat is always an orphan." Prime Minister Vladimir Putin is very unhappy that Team Russia only scored 11th on the team medal charts in Vancouver despite tens of millions of dollars in government funding. The next winter Olympics will be in Sochi, Russia, so Putin and the gov't are going to do everything they can to restore former glory. Former Ivy Leaguers Lead USA To NACAC Wins Max King (Cornell alum) led the men to a 1-4 sweep with the help of Michael Spence (Princeton), Bobby Mack (NC State) and Tom Kloos (Columbia). The senior women were led by race winner Delilah Dicrescenzo (Columbia). Kyle Merber Becomes Second Sub-Four Indoors In Ivy League The deluge of Americans breaking 4 continues in 2010, as Columbia's Kyle Merber became the 2nd Ivy Leaguer ever to run sub-4 indoors with the win and all-time Ivy indoor best in 3:58.52, while LetsRun favorite, Maine's Riley Masters, went sub-4 again. *UW Last Chance Meet Results U. of Minnesota's Ben Blankenship auto-qualified for NCAAs with a 3:57 win in the men's mile. Galen Rupp was 3rd in the mile in 3:58.79 and then an hour and a half later won the 800 in 1:50.64. US Champ and World Leader Ivory Williams Tests Positive For Marijuana Days Before Worlds Williams had been one of the pleasant surprises of the US indoor season. *Ironic New World #1: Dwain Chambers Happy To Be Back In System Chambers gives good quotes and has been one of few athletes to just come clean after getting busted. *Remarkable: Hansons-Brooks Marathoner Desiree Davila Will Run 3000 For USA In Doha We're glad to see Davila getting a little press. Full Event Previews: *Men's *Women's The distance and mid-distance races should be really interesting. *Wednesday AM: US World Leading Sprinter Ivory Williams Pulls Out Of Doha For "Personal Reasons" Personal reasons eventually = tested positive for marijuana. Still awaiting word from Williams on whether this was a case of 2nd-hand smoke or spiked brownies. *48 Hours Ago: US Champion Ivory Williams Now Mentally Ready For The Spotlight After False Starting In '09 The man worried about false starting tests positive for weed. *Indoor Pentathlon Will Determine World's Best All-Around Women's Athlete American Hyleas Fountain is back in the picture, but is Jessica Ennis just too good? 3-Time World Indoor Medalist Mulaudzi Is Skipping Doha Reigning outdoor world champ Mbulaeni Mulaudzi joins other 800m studs Yuriy Borzakovskiy and David Rudisha in skipping the meet. Kalkedan Gezhagne Profile One we hadn't heard before: Her coach tells her to watch Rambo movies to make her a better athlete. Writer: Honor Athlete/Mathmetician Alan Turing At 2012 Olympic Games Alan Turing's story is amazing. Alain Mimoun - A Living Legend Pat Butcher writes after attending a moving documentary in Paris celebrating a legendary French athlete. 30 Years Ago, Craig Virgin Won The USA's 1st World XC Title 30 years later, he is still the only American senior male World Cross-Country champion (he repeated in 1981). Read all about Virgin and his great feat in an absolute must-read by Randy Sharer. MBoards: What about Lynn Jennings? Khalid Khannouchi Is Attempting Another Comeback Former world record-holding American Khalid Khannouchi is in Mexico with his wife and orthotics trying to hold his body together for another run at greatness. It's so cool that Paul Tergat, Haile Gebrselassie and Khannouchi are still going for it despite being almost 40 years old. Michael Johnson on Usain Bolt - "If it were me, I would move to the 400 now." Is he crazy? The 100 is where the money's at. Maybe Michael Johnson is playing mind games in hope that his record doesn't get broken. Mehdi Baala Of France Receives His 2008 Olympic 1,500m Bronze Medal Baala doesn't really fit in the same category as Khannouchi or Bolt, but everyone's a king for a day. Marion Jones And Former Arkansas Coach Nolan Richardson Talk About Her WNBA Tryout With Tulsa Shock Marion Jones might have found the perfect fit in National Collegiate Basketball Hall of Fame coach Nolan Richardson, who is known for the up-and-down, play of the final four Razorbacks of the 90s. Great Story - Ann Wanjiru Selected For Kenyan Team The most positive story we read today. Bekele Conqueror Joseph Ebuya And His Niece Alice Aprot Get A Short Profile Ebuya says Bekele refused to acknowledge him after the race. Kenenisa Bekele 50-50 On Running World XC Things haven't been going well for Bekele in 2010. Natalia Rodriguez - Girl Who Got DQd In Berlin Women's 1,500 Final For Pushing Gelete Burka - Will Compete In Doha If you missed the race (where Shannon Rowbury got moved up to bronze thanks to the fall and DQ), you can watch it here. New Baby Boy Means Phillips Idowu Won't Compete In Doha Idowu is the reigning world champion. Charles van Commenee, who earlier predicted 5 medals for team GBR, is "disappointed." Recommended Read: Inspiring Piece On France's Bouabdellah Tahri He'll run the 3,000 at the Doha Indoor Championships. 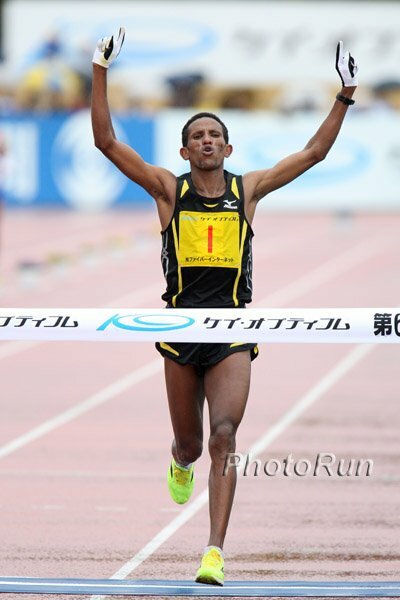 *Tahri YouTube Interview In English Thanks go to two LetsRun readers for the links. Tahri holds 2 European records (steeplechase and indoor 5,000) and he's virtually unknown to most track fans. He finally got a World Championships medal in 2009 in the steeple but he had to run 8:01 just to get bronze by the narrowest of margins in 8:01. Lananna is being selfish to make Jordan Hasay run the DMR, mile, AND 3k! Detroit to level 40 square miles. Is this really America? What's your best pickup line?